In the mid-sixteenth century, the Spanish Court was determined to acquire accurate information about everything being encountered in New Spain. This led to a series of censuses and accounts, including the Relaciones geográficas (Geographic Accounts). The basis for the Geographic Accounts was a 50-question survey, sent to New Spain in 1577. The authorities in each administrative center were instructed to call a meeting of the “Spaniards and other natives in the district”, to find out everything they could about the area’s geography, people and history. Of the 191 known responses to the 1577 questionnaire, 167 have survived in archives to the present day. Most of the original responses are housed in Spain, in either the Archivo General de las Indias in Seville or the Real Academia de la Historia in Madrid, while a further 43 responses form part of the Benson Latin American Collection in the University of Texas library in Austin. (The library’s webpage about the Relaciones geográficas has several links to images of sample pages and maps). The accounts contain a wealth of information about population, relief, flora, fauna, economic activities and lifestyles. Some also include maps of the areas being described. However these early maps do not follow modern conventions in terms of having a uniform scale across the area being shown, or an orientation that is consistent in terms of compass directions. They are pictorial maps, where the scale varies across the map, and where areas are delimited, or places are linked, without apparent regard for direction. 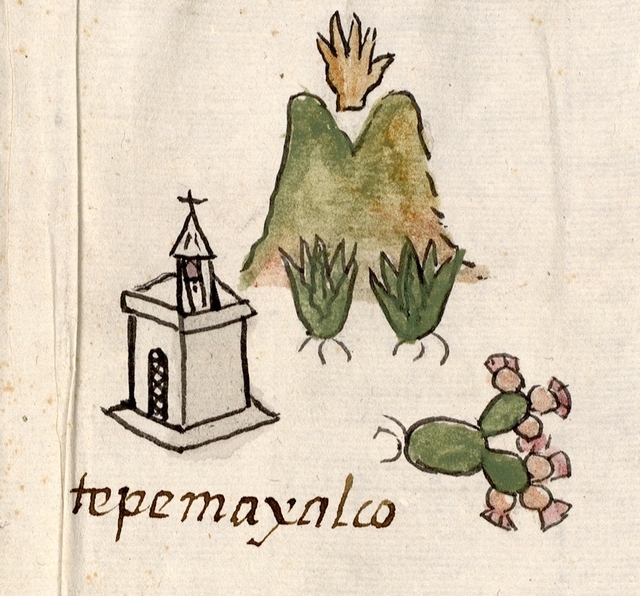 One such map (see image above) depicts the area around Zempoala (Hidalgo). 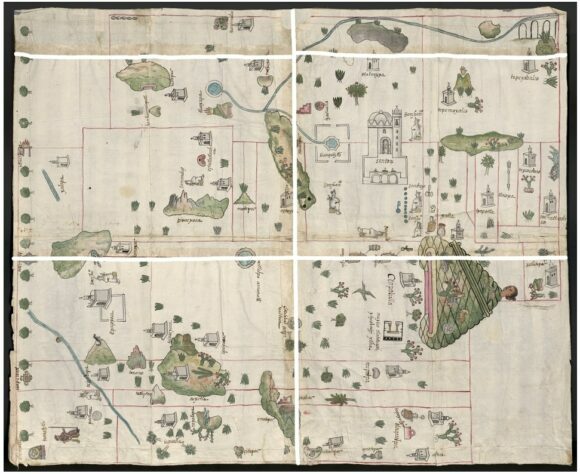 This is analyzed by Barbara E. Mundy, Associate Professor of Art History at Fordham University, in an online article, Mapping Babel: A Sixteenth-Century Indigenous Map from Mexico, published in The Appendix, a “journal of narrative and experimental history”. In the article, Mundy provides a detailed, step-by-step account of the map, with lots of additional related images and information. Mundy’s analysis reveals several “acts of translation” that have been made by the indigenous artist(s) presumed to be responsible for drawing the map. For example, the artist(s) made the Spanish paper provided for the map more closely resemble its indigenous counterpart (bark paper), by joining sheets together to create the size they wanted for the map. In addition, unlike modern maps where the viewer is essentially static, with the map details arranged around them, indigenous maps demand changes of perspective, mobile viewers, who have to reorientate themselves depending where they are on the map in order to see things clearly. The dominant pictogram on this map is that for Zempoala (written “Cenpoballa” on the map). Mundy offers an interesting interpretation of this pictograph, which we hope to examine further in a future post. Barbara E Mundy. 2001. The Mapping of New Spain: Indigenous Cartography and the Maps of the Relaciones Geográficas.